MongoDB is an open-source document database that provides high performance, high availability, and automatic SCALING. 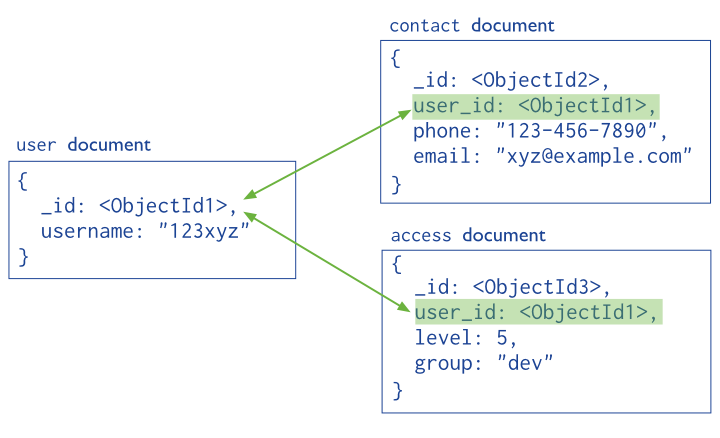 MongoDB documents are similar to JSON objects. MongoDB stores data in the form of BSON -Binary encoded JSON documents which supports a rich collection of types. Fields in BSON documents may hold arrays of values or embedded documents. A record in MongoDB is a document, which is a data structure composed of field and value pairs. 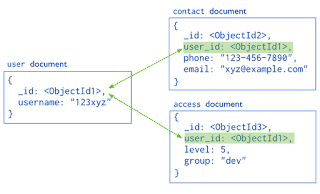 MongoDB stores documents in collections.Collections are analogous to tables in relational databases. Documents stored in a collection must have a unique _id field that acts as a primary key. There are two ways to stores documents in a collection either in Normalized for or embedded into another document itself. The relationships between data is stored by links (references) from one document to another. Embedded documents store relationships between data by storing related data in a single document structure (shown below). These denormalized data models allow applications to retrieve and manipulate related data in a single database operation. It is a specification for storing and retrieving files.It divides a file into parts, and stores each part as a separate document. GridFS uses two collections to store files. One is chunks, and the other is metadata. Sharding or Horizontal Scaling divides the data set and distributes the data over multiple servers-shards. Each shard is an independent database and collectively shards make up a single database. 1) Shards are used to store the data. 2) Query Routers, or mongos instances, interface with client applications and direct operations to the appropriate shard or shards and then returns results to the clients. 3) Config servers stores the cluster’s metadata. This data contains a mapping of the cluster’s data set to the shards. The query router uses this metadata to target operations to specific shards. Step1: Download MongoDB .exe file and install it. be an empty string (e.g. ""). Field names cannot contain dots (i.e. .) or null characters, and they must not start with a dollar sign (i.e. $). If you want to check your databases list, use the command show dbs. This will delete the selected database. MongoDB provides the insert () command to insert documents into a collection. It create collection if they do not already exist. Step 2) Within the "insert" command, add the required Field Name and Field Value for the document which needs to be created. This command creates a collection named log with a maximum size of 5 megabytes and a maximum of 5000 documents. The find command is an in-built function which is used to retrieve the documents in the collection. To display the results in a formatted way, you can use pretty() method. To Return only one document use findOne(). We can also add criteria to our queries so that we can fetch documents based on certain conditions. The $gt means greater than expression. The $gte means Greater Than Equals. The $lt means Less Than. The $ne means Not Equals. Note: Here Employeeid is fields condition and $set is used to change the value. By default MongoDB does not support such primary key - foreign key relationships. However, we can achieve this concept by embedding one document inside another. A replica set is a group of mongo instances that host the same data set. In replica set, one node is primary, and another is secondary. From primary to the secondary node all data replicates. Across multiple servers, the process of synchronizing data is known as replication. It provides redundancy and increase data availability with multiple copies of data on different database server. Replication helps in protecting the database from the loss of a single server. Journaling is the feature in MongoDB that you can use to do safe backups. Db.isMaster() will tell you whether you are on the master server or not. MongoDB allows only one master server, while couchDB allows multiple masters. SELECT * FROM employess WHERE user_name like "%sudhir%"
SELECT * FROM employess WHERE user_name like "sudhir%"